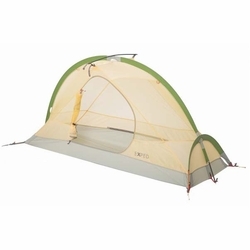 Exped Mira I HyperLite Tent. The Mira I HL offers a balanced combination of space, comfort and light weight - great for solo summer adventures. It has a free-standing design and its ridge pole increases interior space for comfortable sitting. The canopy design combines large fine mesh panels with solid fabric walls. Two vestibules, one of which can be reached through a zippered access This keeps gear out of sight in the rear vestibule. We recommend the use of a footprint as ground protection to extend the life of the floor.